Eye Buy Direct is revolutionizing the eyewear market by providing high quality eyeglasses for a fraction of the traditional price. Eye Buy Direct offers incredible deals by offering you up to 70% off on new glasses with prescription eye glasses starting at $7.95. 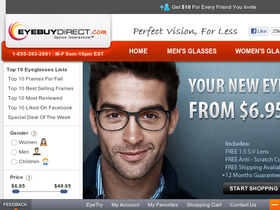 Be sure to check back often at 58Coupons.com for the latest EyeBuyDirect deals, EyeBuyDirect promotions and EyeBuyDirect coupons. Spend over $99 or more online at EyeBuyDirect.com and you'll qualify for Free Shipping. Click link to shop. Head on over to EyeBuyDirect.com to save up to 30% on fashionable glasses in Deal of the Week. Be sure to check back weekly. Click link to view. Use this coupon code to get 10% off any order at EyeBuyDirect.com. Click link to enjoy these savings today. Get on over to Eye Buy Direct to receive your single vision lenses for free. Click link for details.